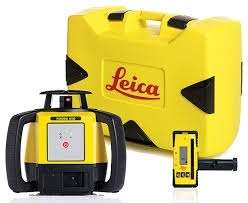 The ideal rotation laser level for all general construction applications, the completely re-designed Rugby 610 from Leica is the horizontal rotating laser level that's robust and flexible enough to deal with anything the modern building site can throw at it. 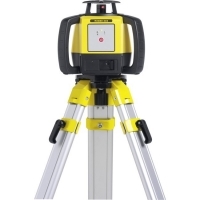 The 610 is ergonomic and tough thanks to its twin handles, sturdy case and IP67 rating, allowing it to stand up to heavy rain and dust ingress. It can even be immersed in water up to 1m deep. Please note - you can upgrade your Rugby laser by selecting any of the options listed above. Whether that's the upgraded and rechargeable Li-Ion battery pack and charger, a solar charging panel, or simply a tripod and 5m staff. Simply tick the boxes that apply and, when you hit 'Add to Basket', both the laser and your chosen upgrades will be added to your basket. Which laser detector should I choose? 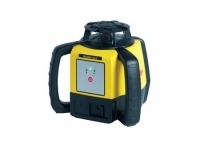 Whilst the Rugby 610 is a superbly accurate, durable and easy to use rotating laser level, it's the laser detector (or 'Rod-Eye') that can make a real difference in terms of both speed and ease of operation. 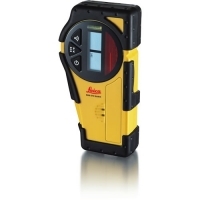 The more advanced Rod Eye detectors have a larger detection window, making it easier and quicker for the user to locate the beam at distance. Weather protection varies too as does battery life, warranty, available detection modes and more. Below is a brief summary of each model that should help you choose.